Leigh Creek is a South Australian outback town situated on Adnyamathanha Country in a picturesque part of the northern Flinders Ranges. Leigh Creek is in the heart of the most picturesque part of the Northern Flinders Ranges in an area of major cultural significance for the Adnyamathanha people in the region. It occupies an important role in the regional economy and offers extensive services to surrounding tourism businesses, pastoral properties, visitors and nearby communities. The town was leased and managed by Alinta Energy, but in June 2015 Alinta announced their intention to close Leigh Creek Coal Mine. The mine closed in November 2015 and the town was handed back to the State Government. The State Government is supporting Leigh Creek to remain open for business, providing strategic support and essential services for about 700 people both in the town and surrounding communities. The Government is helping guide the transition of Leigh Creek from a closed mining town to an open regional service centre with an independent future – a future that is influenced by the local and nearby communities including the Adnyamathanha people. 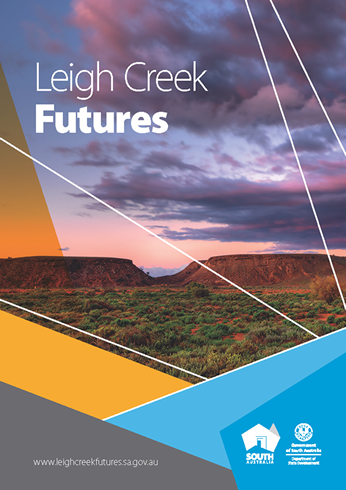 The Leigh Creek Futures report, released on 6 June 2016, has made 30 recommendations to the State Government to maintain and revitalise the township. The report was prepared based on the proposals received in response to the Request for Information – Commercial Opportunities, Leigh Creek and surrounds, in addition to prior and subsequent consultation and investigations overseen by Dr Jane Lomax-Smith. Through the RFI, the State Government received more than 30 responses from people and organisations interested in ensuring a viable future for Leigh Creek. The ideas submitted include a range of proposals for commercial and industrial use of the mine site, use of the area’s natural mineral and renewable energy resources, as well as proposals to use the town’s existing infrastructure for commercial developments including education, training, tourism and arts.